Day 1: Setting off from our home town of Ilkley we aimed to catch the ferry from Heysham on the West Coast of UK. The distance was around 75 miles. 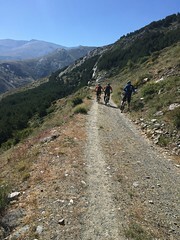 We were a group of four riders and the weather was sunny and warm. The ride over was very picturesque and for much of the route we followed the Way of the Roses ( a great ride from east to west coast uk and part of the national cycle network) the roads were quiet and devoid of much traffic. We stopped for the ubiquitous bacon butties and pot of tea just outside of Hornby. 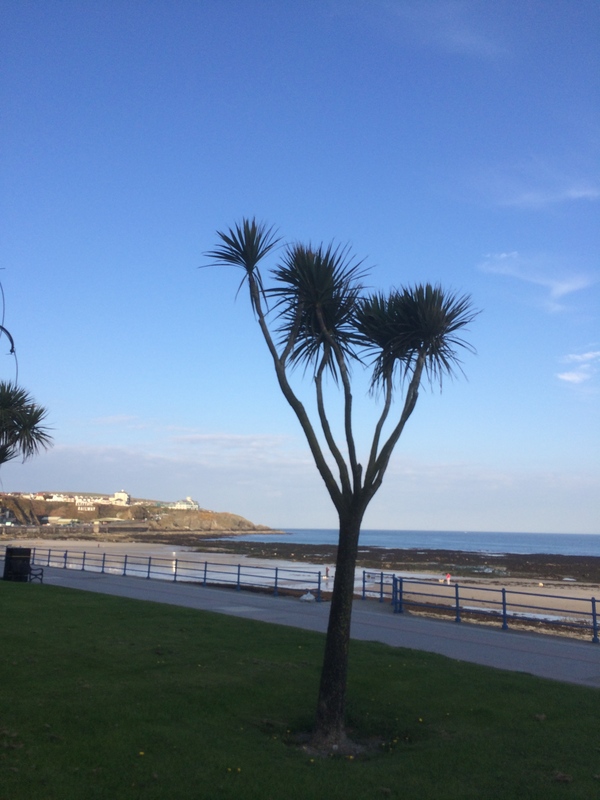 With an easy 20 mile run into Morecambe we eased off the pace and enjoyed our surroundings. 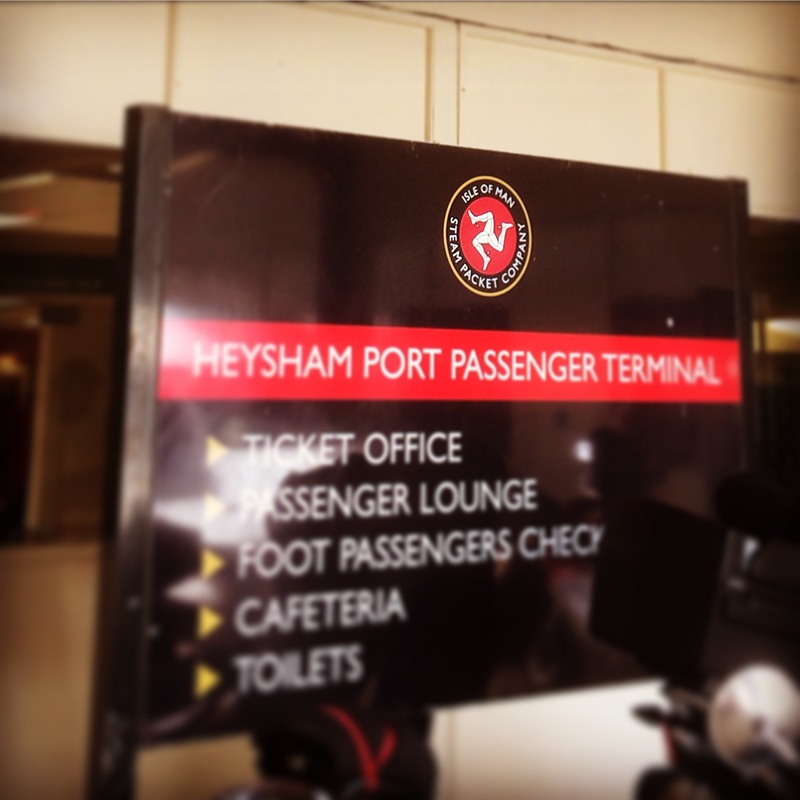 Navigation towards the ferry terminal was straight forward as it is well signposted. However, we did not anticipate the run in on the main roads being so busy, it was necessary to get our heads down and push on to the ferry. Check- in was straight forward, wheeling the bikes onto the ferry not so easy in cleated shoes! once the bikes were secure it was time to head to the bar for a well deserved pint and pork pie. No, it’s not St. tropez! Torquay. Excitedly we jumped on our bikes and rode along the splendid seafront to our hotel. There is a real mix of buildings along the front all were tidy and well kept. 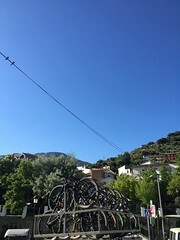 The road that sweeps around the bay also plays host to tram tracks which are one of only a handful in the world that are operated by horsepower. Unfortunately, we had arrived a couple of weeks before they were bridled up so missed seeing them. Our hotel was comfortable and served it’s purpose. 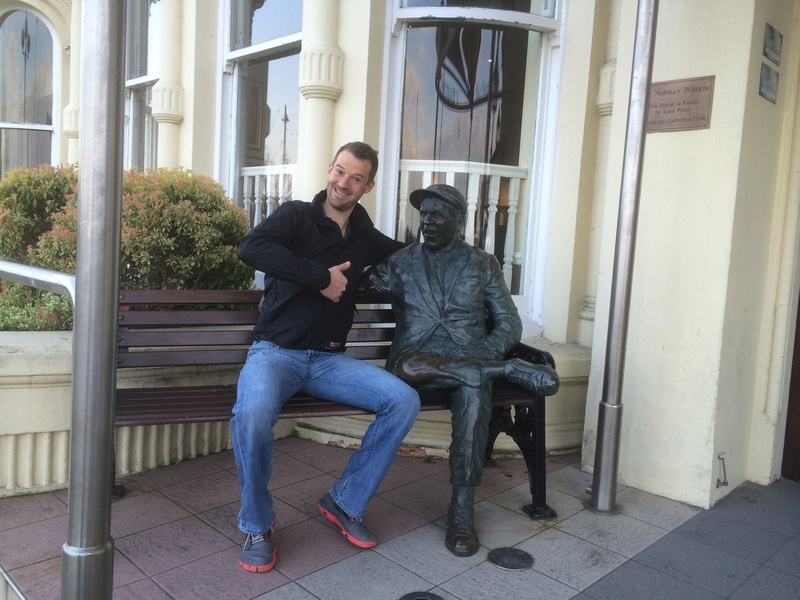 Mr Grimsdale, i have found him Mr Grimsdale….. The road was quiet, undulating and the miles seemed to pass by in a blur. All i could think is why haven’t i been here and done this before. We arrived at Castletown, paused briefly for photographs then pushed on to Port Erin for a coffee stop. What a pretty town, steeped in history and with many friendly residents. We had yet to see a famous tail-less Manx cat but we did see a dog on wheels! It had lost its hind quarters in an accident and the owners had a cart custom made to replace them! Port Erin complete with a dog on wheels! 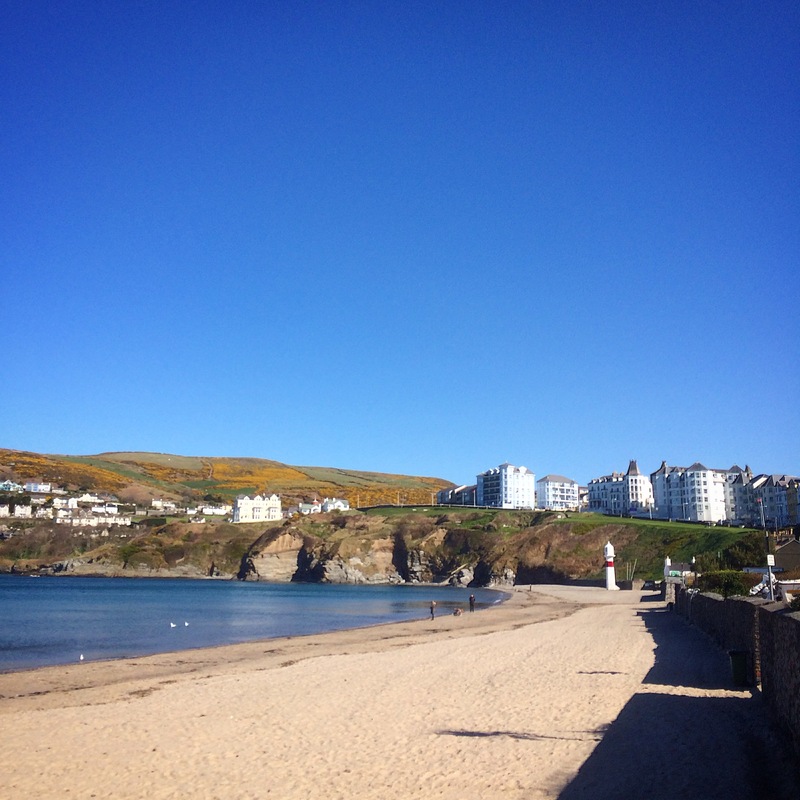 We were a little reluctant to leave Port Erin as up until then we had enjoyed a tail wind. We knew we had a slog for 50 miles into a strong headwind and with rolling hills and exposed coastline there was no escaping it. Next stop was Peel for lunch, we were greeted again by a fantastic beach and this time a castle too. 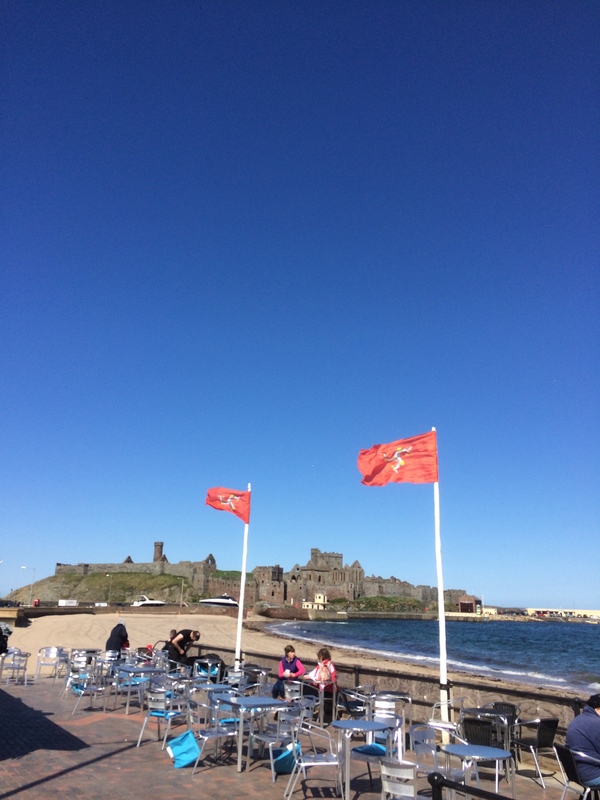 One thing we had all noticed was the abundance of Isle of Man flags. Every other house and public building seemed to be sporting a bright red 3 legged pennant. It was refreshing to see such a public display of Island unity. Following a great lunch at the Harbour house we continued North towards Jurby. 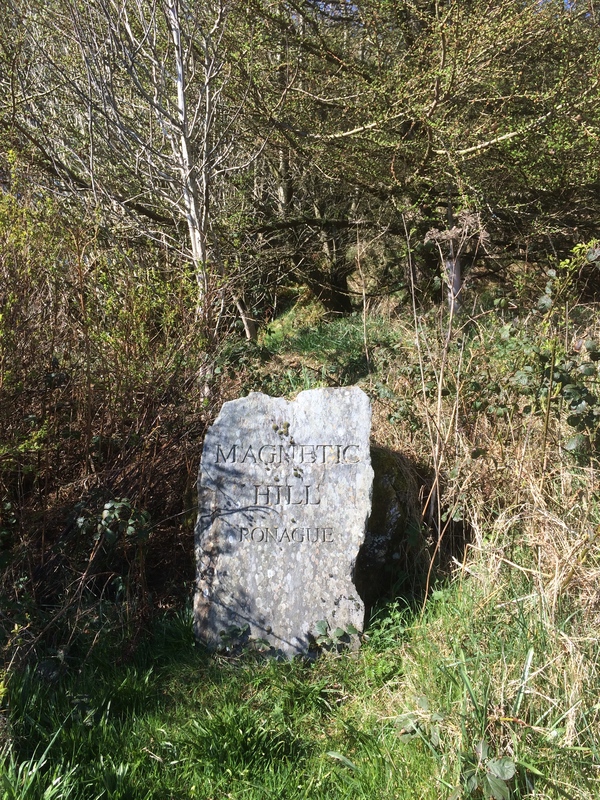 Our route allowed us to take in a so-called “magnetic hill”. I had remembered as a young boy watching a feature on tv about a place in the UK where if you poured water onto a hill it looked like it was travelling upwards. The same applied to cars and in theory bikes! well with so far to go in the day we thought a hill that you didn’t have to pedal up would be most welcome. A large stone marks the beginning of the ascent . 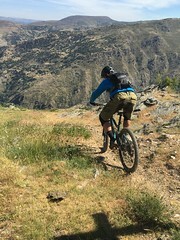 We all stopped pedalling and waited to be propelled upwards…… perhaps it was because we were on carbon not steel bikes!! we all ground to a halt and would have gone backwards and fallen off had we not intervened. So it was back into the rhythm and onwards towards Jurby and the north of the island. Along the way we began to notice the distinctive black and white kerbsides that marked out the legendary TT motorcycle course. Pushing along into a headwind at less than 20mph it was difficult to imagine how they negotiated those bends and fast straights at speeds over 200mph. Turning left at the abandoned fighter airfield at Jurby we began to climb up and over the highest point on the TT course and indeed on the island, Snaefel at just over 2,000ft it certainly made for a tough climb. 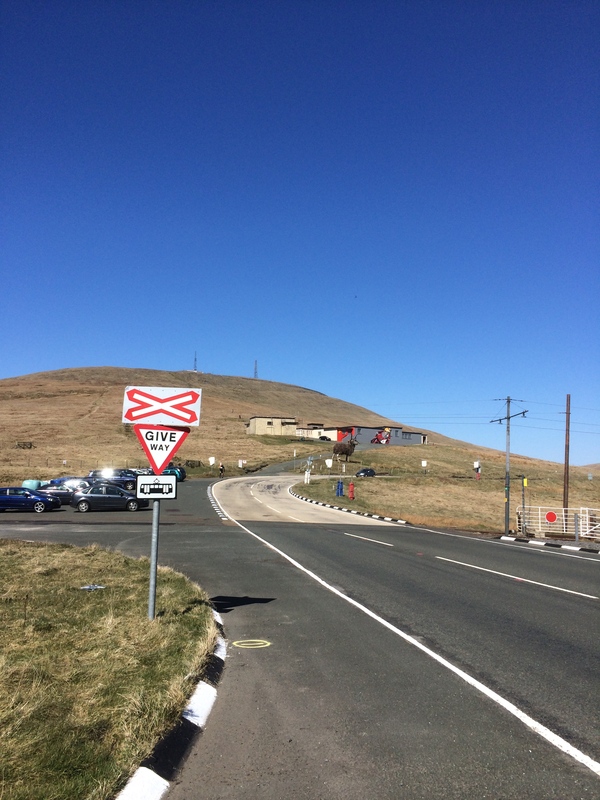 Summit of Snaefel and one of the fastest parts of the TT course. from the built up areas it was a section motorcyclists and car drivers alike were not afraid to put their foot down. 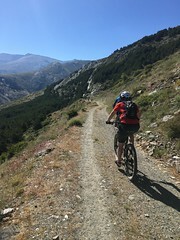 Vehicles were whipping past us at breakneck speed and it was with great relief that we finally turned off the main road onto what appeared at first to be a farm track. We had gone from the ridiculous to the sublime and once again we were bathed in the sounds sights and smells of a warm sunny day in the countryside. Above hand-gliders swooped and rose on the thermals, below, the tarmac continued to roll as some shelter from the wind was provided by the “bocage” like hedging. 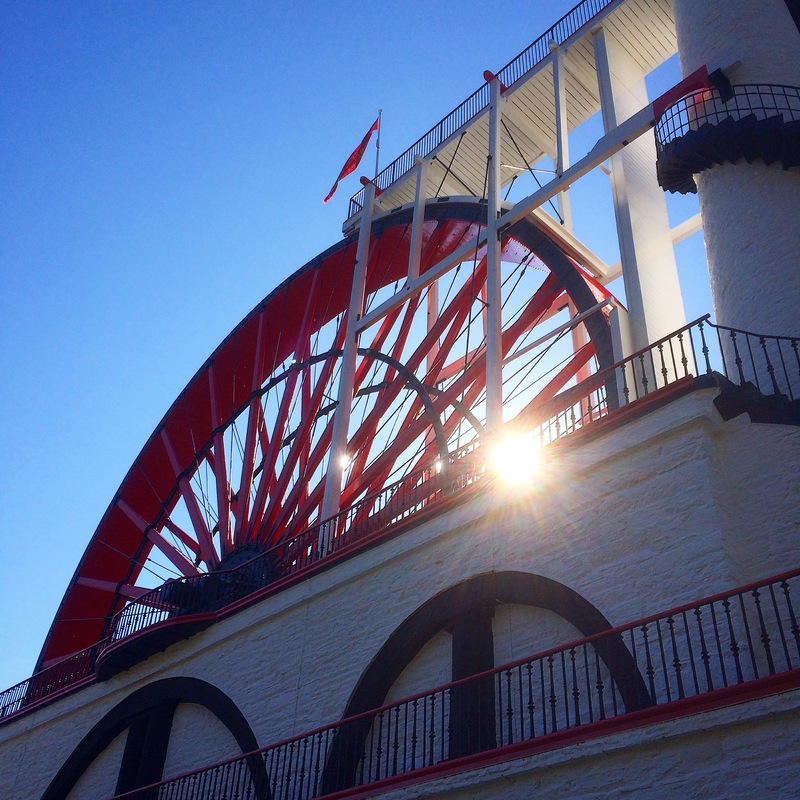 Next stop Ramsey, famous for it’s giant waterwheel. 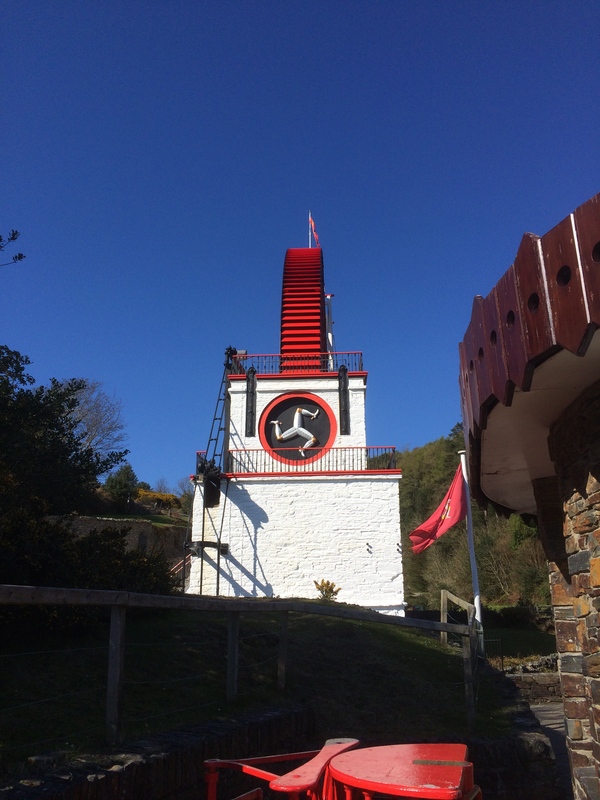 This is one of the symbols that has come to promote and reflect the Isle of Man. We were all looking forward to seeing it. However, first there was a calorie deficit to rectify. 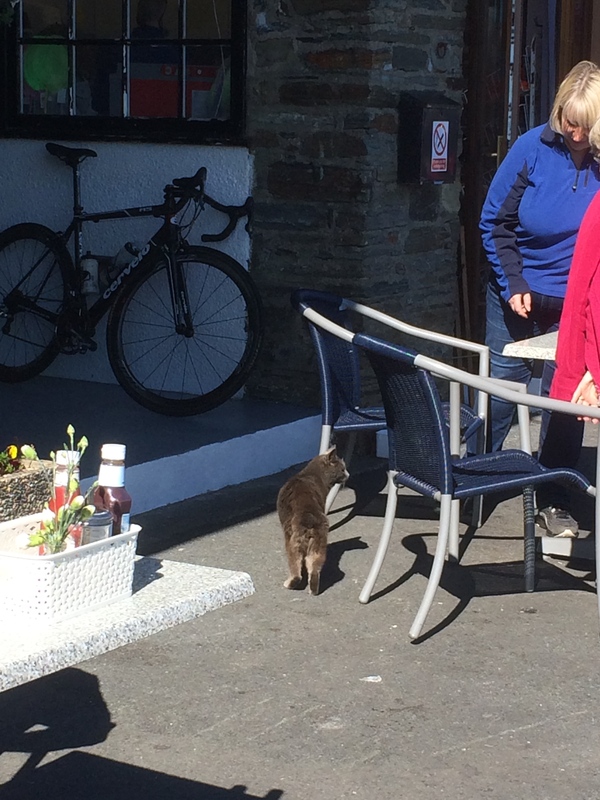 It was whilst sitting in the sunshine eating locally made cakes and drinking our tea that we spotted our first (and only) tail-less manx cat. Tail-less chocolate gobbling manx cat. He paid little interest to us and was certainly not going to pose to have his picture taken. What he was interested in was the large chocolate 99 flake that had just been dropped by a very disappointed young boy. Still, tourists loss, cat’s gain. With out so much as a pause for breath he wolfed the whole thing down! With the feline entertainment over we re-mounted and head back up the hill to see the victorian waterwheel. Wow, what a fantastic piece of victorian engineering. It was lovingly restored and was one of those places that you wish you had given more time to. 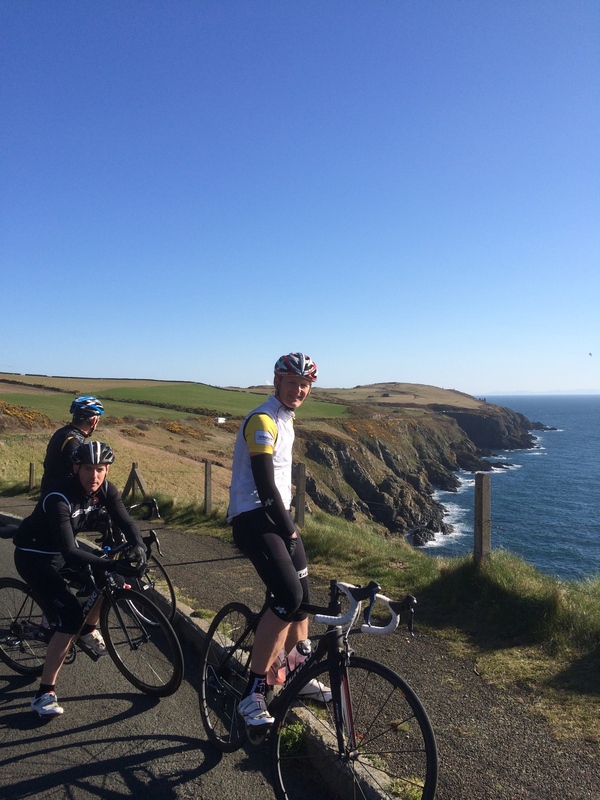 From Ramsey it was a steady drag with tired legs back to Douglas and our hotel. 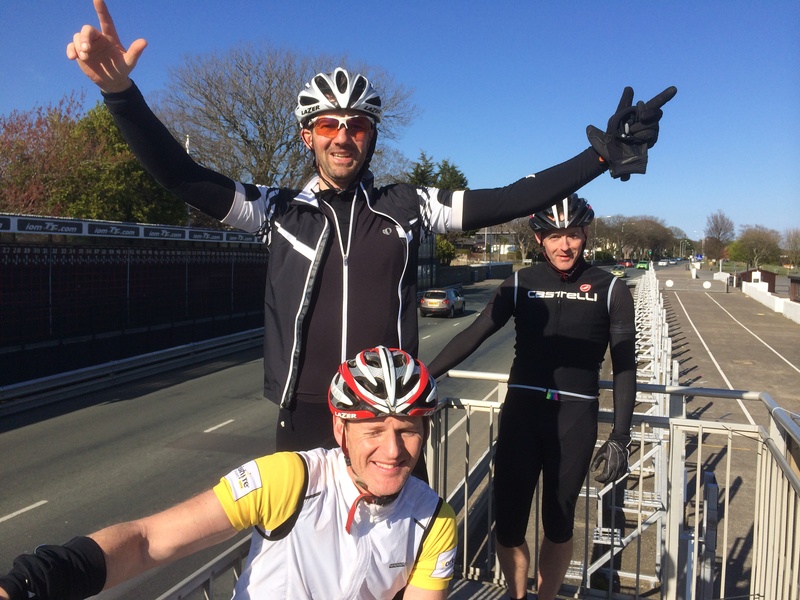 However, not before we had stopped at the start/finish line of the TT course. It is a strange sight to see everyday cars and bicycles pooling through at 30 mph when you knew that once a year for two weeks the place would be a hive of activity and a matter of life and death. 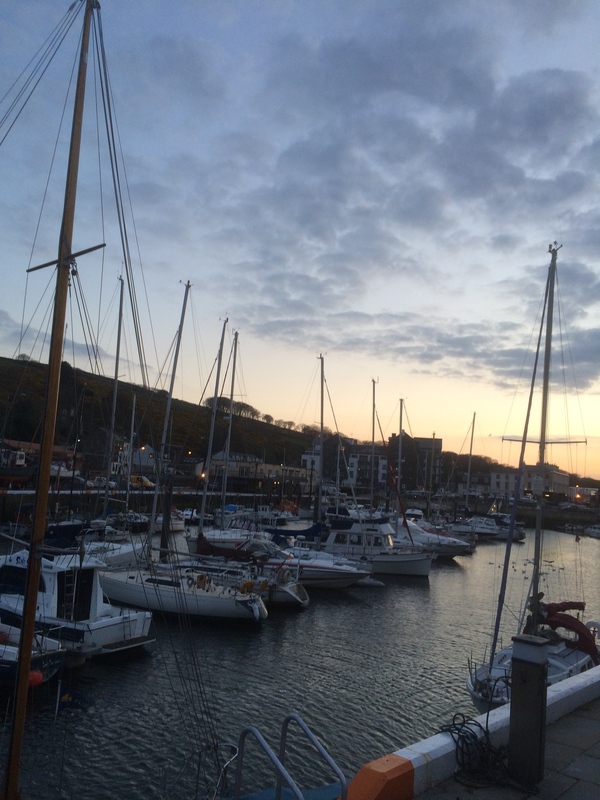 That evening, sitting in the beautiful harbour area of Douglas, drinking a pint or two of Okells beer, we reflected on a fantastic days riding. Yes, the weather helped but even without it there was so much to see, so many charming friendly people to meet and mile after mile of fantastic roads to enjoy. It is somewhere i will definitely return to.